A new classic, cited by leaders and media around the globe as a highly recommended read for anyone interested in innovation. 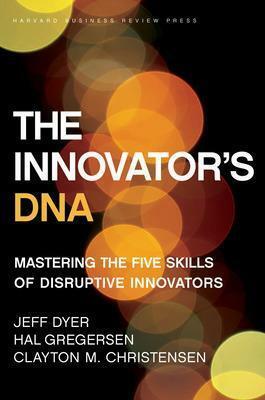 In The Innovator's DNA, authors Jeffrey Dyer, Hal Gregersen, and bestselling author Clayton Christensen (The Innovator's Dilemma, The Innovator's Solution, How Will You Measure Your Life?) build on what we know about disruptive innovation to show how individuals can develop the skills necessary to move progressively from idea to impact. By identifying behaviors of the world's best innovators--from leaders at Amazon and Apple to those at Google, Skype, and Virgin Group--the authors outline five discovery skills that distinguish innovative entrepreneurs and executives from ordinary managers: Associating, Questioning, Observing, Networking, and Experimenting. Once you master these competencies (the authors provide a self-assessment for rating your own innovator's DNA), the authors explain how to generate ideas, collaborate to implement them, and build innovation skills throughout the organization to result in a competitive edge. This innovation advantage will translate into a premium in your company's stock price--an innovation premium--which is possible only by building the code for innovation right into your organization's people, processes, and guiding philosophies. Practical and provocative, The Innovator's DNA is an essential resource for individuals and teams who want to strengthen their innovative prowess. &#147;Businesses worldwide have been guided and influenced by The Innovator's Dilemma and The Innovator's Solution . Now The Innovator's DNA shows where it all starts. This book gives you the fundamental building blocks for becoming more innovative and changing the world. One of the most important books to come out this year, and one that will remain pivotal reading for years to come." &#147; The Innovator's DNA is the &#145;how to' manual to innovation, and to the fresh thinking that is the root of innovation. It has dozens of simple tricks that any person and any team can use today to discover the new ideas to solve the important problems. Buy it now and read it tonight. Tomorrow you will learn more, create more, inspire more." &#147; The Innovator's DNA sheds new light on the once-mysterious art of innovation by showing that successful innovators exhibit common behavioral habits&#151;habits that can boost anyone's creative capacity." "The process of Low End Disruption is beautifully described in Clayton Christensen's series of books: The Innovator's Dilemma, The Innovator's Solution and The Innovator's DNA. If you haven't read them, you should. What's amazing about these books is not only how important their conclusions are but how well researched they are." -- TechCrunch "This final entry in coauthor Christensen's innovation trilogy complements his influential The Innovator's Dilemma (1997) and coauthored The Innovator's Solution (2003) with a notably accessible style." -- The Journal of Product Innovation Management "pocket-sized map...to your innovation journey" -- Strategy+Business "The Innovator's DNA is a fascinating book, filled with stellar examples, and of course tips, to enhance creativity in your life. I highly recommend this book to chemical engineers for both personal and organizational development." -- American Institute of Chemical Engineers "Through numerous examples of innovative people and companies, the authors inspire readers to make a positive impact through innovation. Summing Up: Highly recommended." -- CHOICE "The book will challenge readers to think differently and act differently to generate creative ideas for new products, services, processes and businesses." -- Malcolm Rittman, CMI (Reviewed as Chartered Management Institute's Innovation and Entrepreneurship Book of the Year 2011) "A terrific and inspiring read, very accessible and deceptively easy to absorb. It provides an accurate reflection of what is known about innovation today and I really believe that it will have an impact on actual practice and on raising people's aspirations in regard to innovation." -- Professor James Fleck, Professor of Innovation Dynamics at The Open University "The Innovator's DNA is a book that should interest a broad audience, including inventors, researchers, and professors seeking greater creativity in their teaching and research. Read it to find inspiration -- and ways to put down your knitting." -- PRISM Magazine "one of the most interesting books on innovation to come along in a while." - Ottawa Business Journal "The book adds a great deal to our understanding of the mindset of path breaking innovators." -- San Jose Mercury News "the book is easy to read, jammed with examples and, at a time when innovation is a beacon, offers an interesting model to consider." -- Globe & Mail Marc Benioff, Chairman and CEO, salesforce.com; author, Behind the Cloud-- "Businesses worldwide have been guided and influenced by The Innovator's Dilemma and The Innovator's Solution. Now The Innovator's DNA shows where it all starts. This book gives you the fundamental building blocks for becoming more innovative and changing the world. One of the most important books to come out this year, and one that will remain pivotal reading for years to come." Scott D. Cook, Chairman of the Executive Committee, Intuit Inc.-- "The Innovator's DNA is the 'how to' manual to innovation, and to the fresh thinking that is the root of innovation. It has dozens of simple tricks that any person and any team can use today to discover the new ideas to solve the important problems. Buy it now and read it tonight. Tomorrow you will learn more, create more, inspire more." Stephen R. Covey, author, The 7 Habits of Highly Effective People and The Leader in Me-- "The Innovator's DNA sheds new light on the once-mysterious art of innovation by showing that successful innovators exhibit common behavioral habits--habits that can boost anyone's creative capacity." A.G. Lafley, retired Chairman of the Board and Chief Executive Officer, The Procter & Gamble Company-- "Having worked with Clayton Christensen on innovation for over a decade, I can see that The Innovator's DNA continues to stretch our thinking with insights that challenge convention and enable progress in the important cause of innovation ... so critical to competitiveness and growth."